Many Americans like the idea of a revolution, especially in a country founded on revolution, but why is Nader running again? 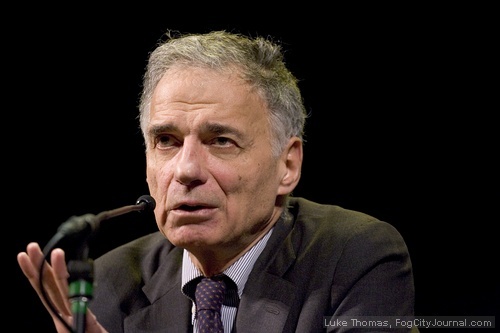 Nader cited rising gas prices and healthcare costs, corporate subsidies, “bloated” military spending, labor law reform, public campaign financing, special interest lobbying and ballot access restrictions as reasons for his 2008 presidential bid. On the topic of healthcare, Nader wants to know why Democratic candidates Hillary Clinton and Barack Obama have not stated their support for a single-payer healthcare solution. “All the candidates – McCain, Obama and Clinton – are against single-payer health insurance, full Medicare for all. I’m for it, as well as millions of Americans and 59% of physicians in a forthcoming poll this April,” Nader said on “Meet the Press” with host Tim Russert. Obama and Clinton have promised healthcare to the nation’s uninsured, but neither have spoken out in support of the United States National Health Insurance Act (H.R. 676), first introduced in 2005 by Rep. John Conyers, Jr. (D-MI). Nader has long been a scapegoat for the outcome of the 2000 election when he ran on the Green Party ticket. But he refuses to take the blame. “So why do they blame the Greens? Why do they blame the people all over the country who are trying to have a progressive platform, not just the environment,” Nader said. “Wow, that’s really unfortunate. I remember when he did this before. It’s not good for anybody, especially our country,” she said. “He thought that there was no difference between Al Gore and George Bush, and, eight years later, I think people realize that Ralph did not know what he was talking about,” Obama said to reporters at a town hall meeting, Sunday. 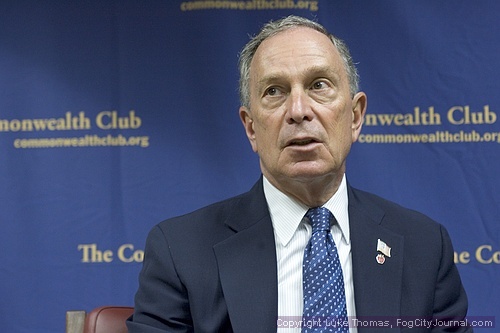 New York City Mayor Michael Bloomberg spoke out in support of Nader probably because Bloomberg himself might run for president as an independent candidate. One wonders how Bloomberg might have responded if he had no interest in running for president. “This business of Ralph Nader being a spoiler – you know, in any three-way race, two of the three are going to be spoilers,” he said to the Associated Press. I watched the 80th Annual Academy Awards Sunday night with my parents because they’re the last two people on earth who still care about the Oscars. Los Angeles Mayor Antonio Villaraigosa attended the Oscars with his daughter. Villaraigosa is no longer dating former Telemundo newscaster Mirthala Salinas, which frees him up to work as campaign co-chair for Hillary Clinton. Los Angeles Mayor Antonio Villaraigosa with his daughter. Villaraigosa’s friend and gubernatorial rival, San Francisco Mayor Gavin Newsom, didn’t attend the Oscars. In brand-new couple news, Sean Penn – currently shooting “Milk” in San Francisco – and model Petra Nemcova might be an item. Sean Penn and Petra Nemcova at Elton John’s Oscar party. The actual telecast wasn’t too boring. Host Jon Stewart did a much better job this year than in 2006, and the show was only three and a half hours long. Stewart kept the political jokes to a minimum, but those were my favorites. “Normally, when you see a black man or a woman president, an asteroid is about to hit the Statue of Liberty,” he tittered. 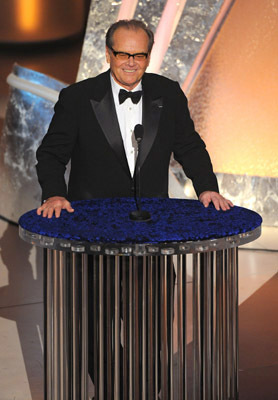 My favorite presenter was Jack Nicholson who always gets a front row seat even when he’s not nominated. Half the fun of watching the Oscars is seeing Nicholson heckle the presenters on stage. Jack Nicholson’s been stealing my dad’s look since the ’70s. American nominees were snubbed for all four acting awards: British actress Tilda Swinton won Best Supporting Actress for “Michael Clayton”; Spanish actor Javier Bardem won Best Supporting Actor for “No Country for Old Men”; French actress Marion Cotillard won Best Actress for “La Vie en rose”; and Anglo-Irish actor Daniel Day-Lewis won Best Actor for “There Will Be Blood”. Those British actors always have to steal our thunder, with their fancy accents and classical training. Not fair. To add insult to injury, Swinton and Day-Lewis both played Americans. It’s just like the old website, only better. Enjoy! …is it bad for me to be excited about Ralph Nader running? P.S. Elaine is quality. Nicholson is always 2 years behind your dads look. File that under camel. 1. 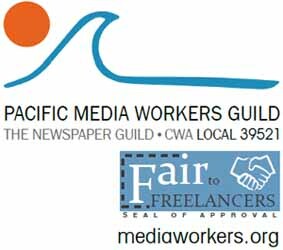 New site looks good. 2. We watched the Oscars also. 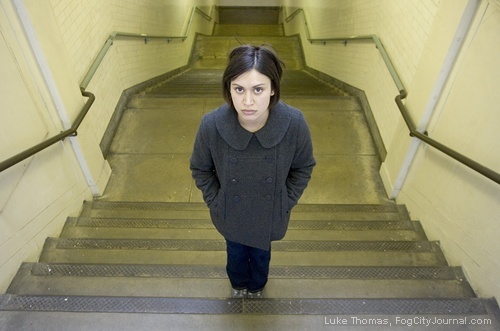 How come British actors do Souhern accents better than Southerners? 3. Regarding Nader’s reference to Thomas Jefferson, if Tom were around today, the Repubs would call him “that Frenchman,” just as his opponents did when he ran for prez. The Founders were just ordinary men in those days. It takes time to become a revered idol. Who among us today will hold that status 200 years hence? Obama?